I need a break from Thanksgiving. Already! That’s what happens when you put out Halloween decor in July. P.S. I am an old lady. It never fails that come the holiday season, I seriously have no clue what to eat for dinner. Never.ever.fails. It’s like my brain can’t get past all of the cookies and appetizers and cocktails and stuffing and twice baked potatoes. It’s like my mind is totally wiped clean of all normal dinner ideas and I want to eat cheese and crackers with a side of wine. So this is what I’m eating this week. It’s my wineless answer. Now it’s no secret that I love a good salmon salad. Next to taco salads, they are my go-to way of making myself get those veggies. Which we all know really just means a whole boatload of things that aren’t vegetables on a bed of lettuce. Buuuuuut… oh well. Roasted chickpeas are also a staple on my salads – it’s almost impossible for me to consume one without. My salads aren’t high maintenance or anything. I have no idea where they get it. Oh and even though this seems a bit summery, it’s quite filling and fits the season. In a weird way, it’s almost comforting. It’s like salad comfort food, if that can be a thing. There is so much texture and CRUNCH. Pretty much live for it. Just to complicate things, I threw together a quick ranch drizzle with greek yogurt. I swear that a little goes a long way and it makes the salad. 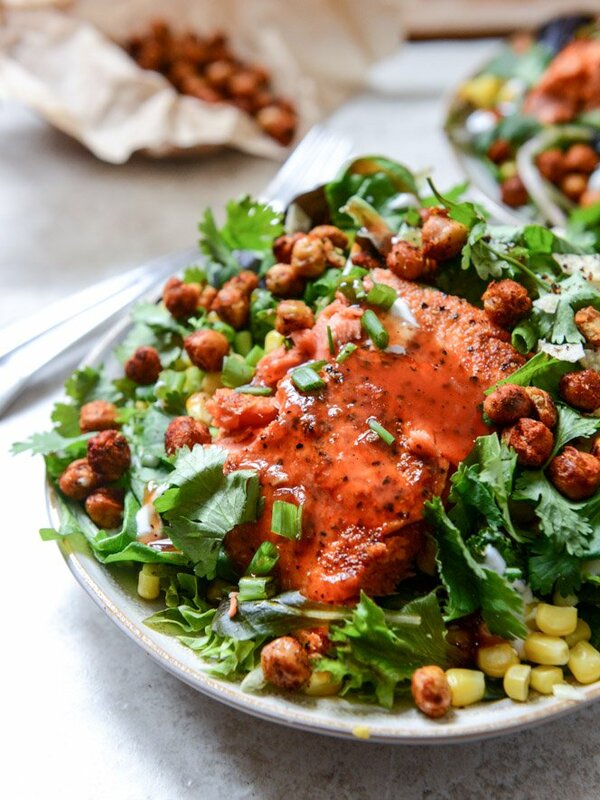 Along with the BBQ sauce drenched salmon, crunchy chickpeas, crushed tortilla chips, corn and scallions, this flavor combo blew my mind. This means that I will eat it approximately 13 days in a row, then get so sick of it that I won’t be able to even think of such a salad for at least a month. And no, I’ll never learn. To prep, roast the chickpeas first. You can do this a few hours ahead of time if desired. In a small bowl, mix together the sugar, paprika, onion powder, garlic powder, salt and pepper. Season the salmon with the mixture, covering both sides. (if you get salmon with skin on, I use the spice rub just on the top.) Heat a large skillet over medium heat and add the olive oil. Add the salmon and cook on one side for 2 minutes, then flip and cook until the fish is flaky and opaque, about 5 minutes. Brush the BBQ sauce all over the salmon. To assemble the salads, combine the lettuce, corn and green onions in a bowl. 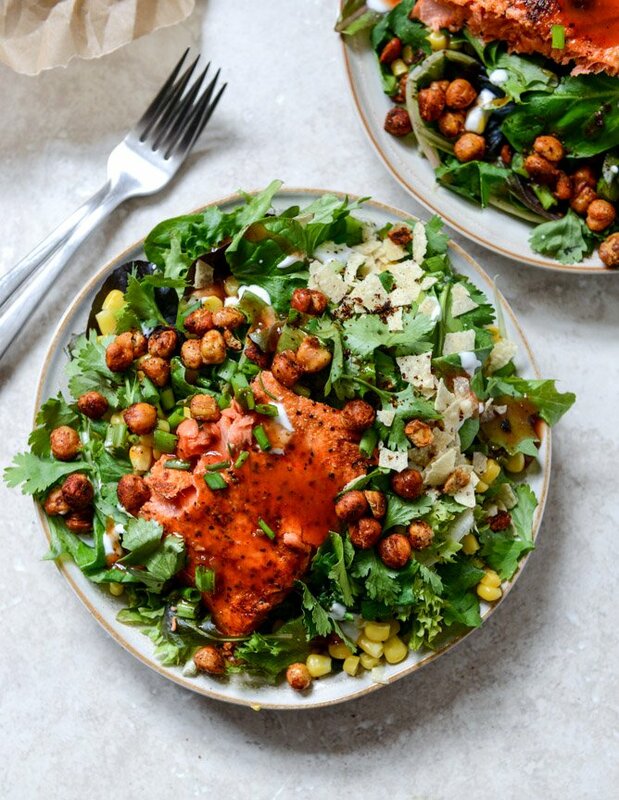 Add the salmon and chickpeas on top, then drizzle with the ranch. Top it off with the crushed chips, chives and cilantro. Serve! Combine all ingredients in a large bowl and whisk until combined. Drizzle overtop of salads! I like a cute salad.